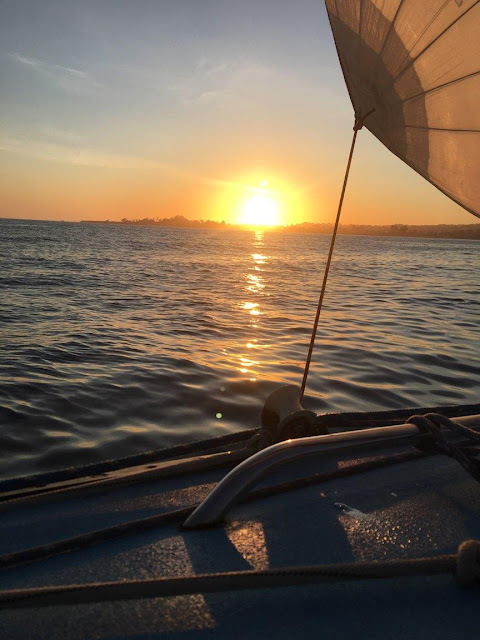 After not being able to sail for the first two Tuesdays of the season because of rain, it was fantastic to see clear skies and the wind blowing steadily out of the East. As the boats filed out of the harbor, the obvious choice for the course was Bravo 2 omitting the absent Blacks. The course was a simple beat to SC3 and back to the finish mark. After rounding SC3 we set the pole and started slogging into the waves back toward the start mark in what was becoming a dying easterly. I thought the water seemed to be flatter closer to shore and headed in that way. This allowed us to take the waves at more of an angle so they wouldn’t stop the boat. Homer followed us and passed us. 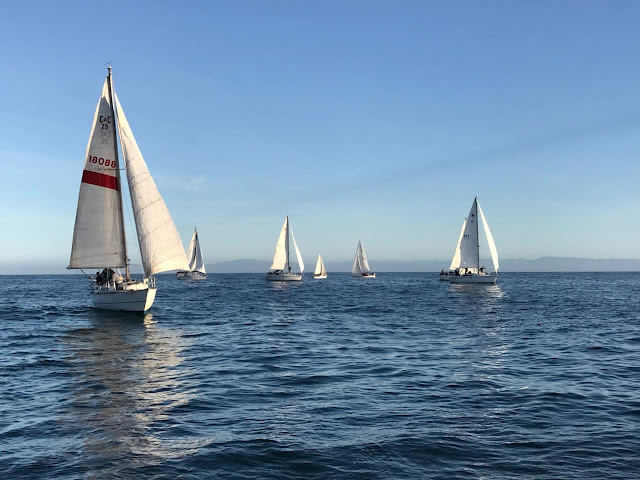 Ultimately the 40 foot boat finished way ahead of the fleet and Equinimity and Pacific Spirit finished ahead of Pair a Dice. There may have been a couple of other boats ahead, but by this time everyone was spread out and I couldn’t tell which boats had finished. We witnessed a close finish between Perfect 36 and Sea Quake. From our angle, we could not tell who was first, but was Perfect 36 a foot ahead of Sea Quake? We had a great barbecue at the club. It was fantastic to finally be sailing Tuesdays again. Each week, we will have a sheriff boat that will sail outside the line sighting the line for boats that are over early. Rather than going through the line like other boats, the sheriff boat will start outside the line. This can be an advantage for the sheriff boat, but all boats that want to be sheriff will get their turn. It has been proposed that the sheriff boat will blow a horn at the start to let everyone know the start time. Since being sheriff is easy sailing and not fighting for position on the line, a horn at the start would be a nice touch. In our Tuesday night sailing, we have never adjusted results for PHRF ratings. We have always tried to call the finishers in order. On the course card, the distance for each course is noted so we can always take a finishing time and note the PHRF difference to approximate how you would do in a real race. My thought has always been to use Tuesday nights as a learning experience. It does not matter if you are the first over the line or the last, there are always close competitors to compare your performance and improve. As long as we are all learning, we are all winning! For people that want to be more competitive and be able to apply the PHRF rating, it may be good for everyone to run Race QS and upload. If we all did this, we can all ascertain what time each boat finished. As faster boats join our fleet, do not get discouraged, just keep learning and improving your sailing. On April 14, SCYC will be having a one day regatta: the Commodores Regatta. PHRF certificates will not be necessary for this race. A lot of you are really picking up your game and it would be great to see a good turnout for this regatta. It will be a reverse PHRF (pursuit race) where slowest boats start first followed by faster boats. If everyone sailed a perfect race, we would all finish at the same time! It is nice because these races often have an empty start line unless there are other boats in your class. I am looking forward to next Tuesday! You can also see lots of interesting data by pulling out the sidebar on the left side of the display, and check out boat vs. boat comparisons for each leg of the race and the race overall. As Barry mentioned it would be great to see more boats recording and up loading data on RaceQ's for interesting replays of the race. Get signed up today! There did appear to be a pretty big lift after the start for boats that headed toward the beach on starboard tack. Then a bit of a lift as boats sailed on port towards the point and near SC3. Being the inside boat on these lifts had some advantage. The wind also appeared to die on the downwind leg back to the finish line and we didn't see the usual stronger puffs off the beach and westerly running current along the beach on the last leg.